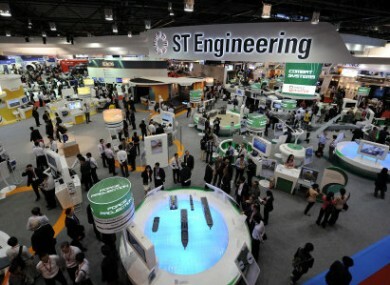 Visitors on the opening day of the Singapore Airshow in 2012. THE FIRST EVER joint trade mission of Irish, British and Northern Irish representatives is currently taking place in Singapore ahead of Asia’s largest airshow. The two-day joint mission is being led by Minister for Jobs, Enterprise and Innovation Richard Bruton along with UK Transport Minister Stephen Hammond and Northern Ireland Enterprise Minister Arlene Foster and will include events in both Singapore and Malaysia. More than 60 companies, including over 40 Irish companies, are taking part in what will be four days of activities for Enterprise Ireland. The department say that the trip is Bruton’s 19th major trade or investment mission since taking office in March 2011 and is part of a commitment to double the number of trade missions over the past two years. The previous trade mission to the Gulf Region drew criticism for not addressing human rights issues in states such as Qatar and the United Arab Emirates. The itinerary of the Asian trip is expected to include meetings with with three Government Ministers in Singapore and Malaysia as well as a Central Bank Governor. The centrepiece of the trip is the Singapore Airshow which begins tomorrow at which Enterprise Ireland and UK Trade and Investment will have a joint stand. Official estimates say that there are 250 companies active in the aviation sector in the Republic of Ireland contributing about €4.1 billion to GDP with revenue in excess of €1. billion being generated in Northern Ireland. “This first joint mission has attracted an impressive list of companies from Ireland, Northern Ireland and the UK,” said Bruton. Both the Irish and British Governments have said that the collaborative nature of the trip is as part of a programme of cooperation to strengthen relations over the next decade. The forthcoming trip of President Michel D Higgins to Britain in April is also part of that commitment. Email “Where's Richard Bruton this week? Singapore apparently”. Feedback on “Where's Richard Bruton this week? Singapore apparently”.